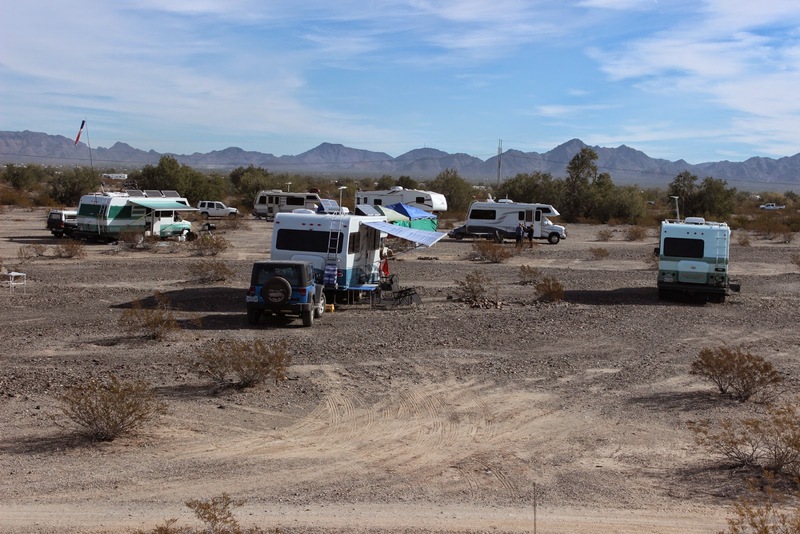 Heading towards Quartzsite for a campout meeting with other Lazy Daze owners. Organized By Roger on Roger's 1/2 acre in La Posa West. 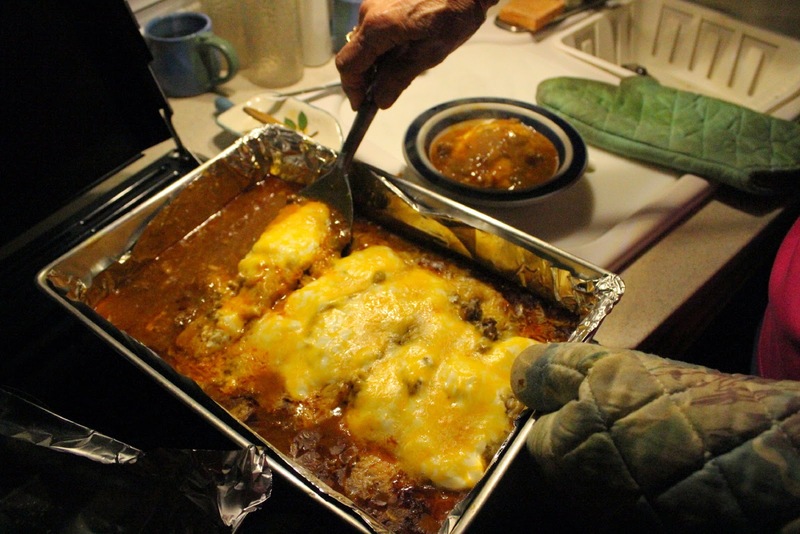 Along the way, Jan is inspired to try a recipe from her Texas cookbook for Enchilada Casserole. Absolutely delicious and not too, too hot. 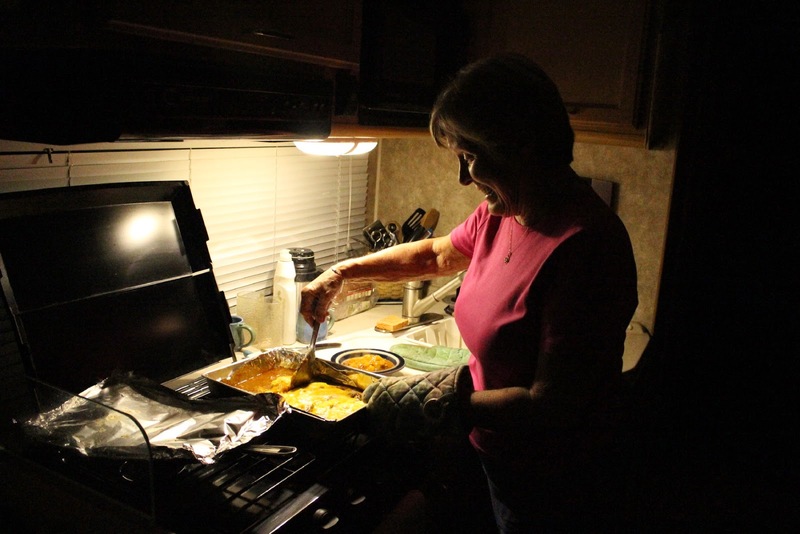 Jan loves cooking in her Lazy Daze kitchen. Everything she needs is close by and the stove and the oven work quite well. 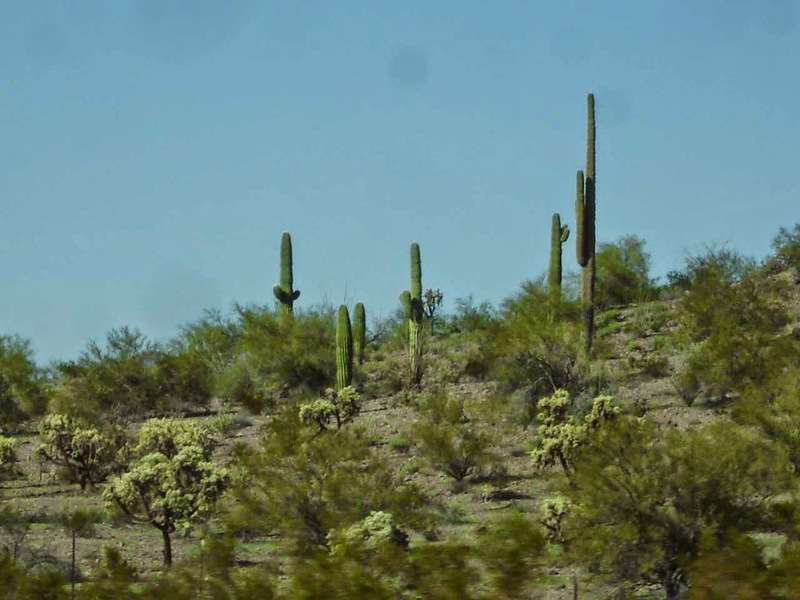 On our way from Casa Grande, Arizona, Jan and I decide to go on Route 8 to Route 85 in Gila Bend north to Route 10 and then west to Quartzsite. This route avoids the busy traffic around Phoenix and is also a beautiful ride. 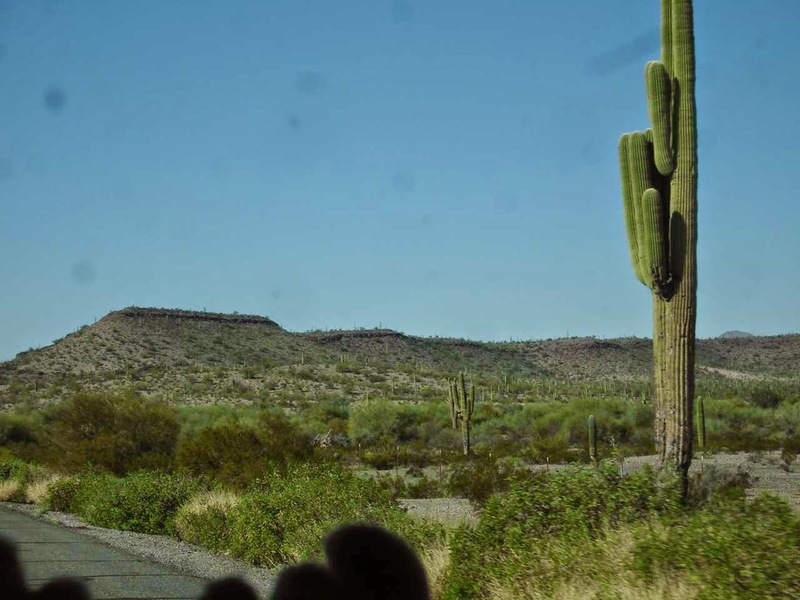 Jan and Eustis get quite excited about the first sightings of good sized Saguaro cactus. Roger's half acre is located in La Posa West LTVA(long term visitor area)BLM (Bureau of Land Management) in Quartzsite. It is far enough away from the crowds of rvs and close enough to walk to the huge tent of vendors and all the other vendors in the Tyson Wells area or, for that matter, the center of town. We pay $40 for two weeks of boondocking. The $40 allows us to access the BLM dump station and fresh water for the two weeks as necessary. Roger gathered about 20 Lazy Daze units this year. All models from 24 foot to 26 foot, to 31 foot. Last year, we posted pictures on this blog of the tent and some of the vendors in the area. This caught our eye this year. 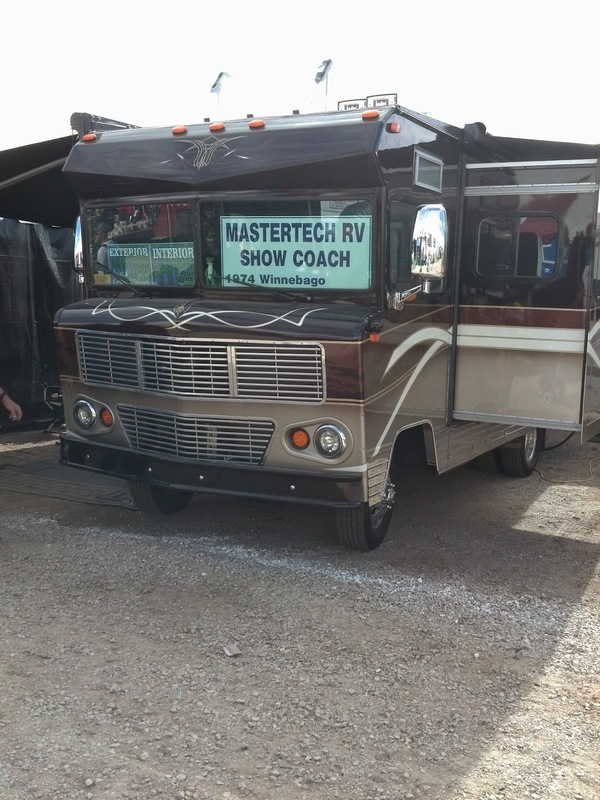 Mastertech RV is an RV remodeler and repair. They took a 1974 Winnebago owned by the business owner, and remodeled it inside and out for a modern look. The outside walls were redone to modern finish and including two slideouts. The workers there indicated that the engine is still the same--it was good--, but Class A air bags were installed. The inside is beautiful--completely modernized. The remodel took something like 4,000 hours of labor. The view to the rear of Lady Blue. 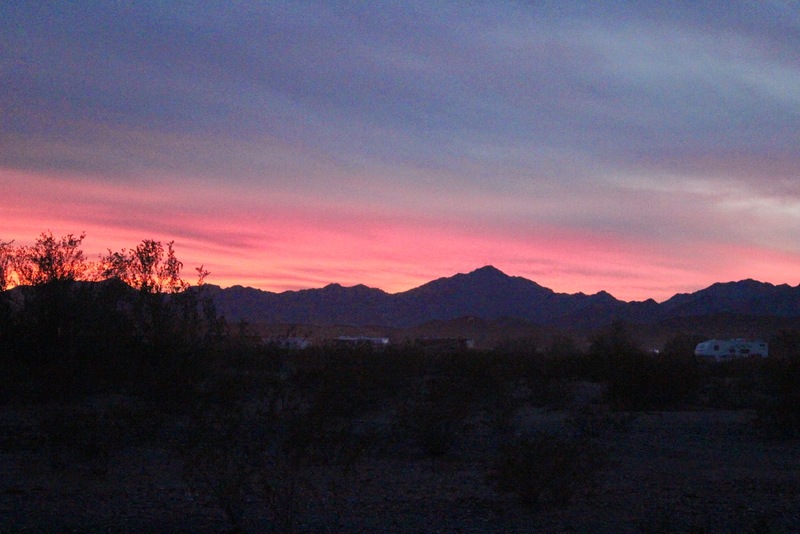 Nice mountain scenery and a wonderful setting for some beautiful Arizona sunsets. The group gathers, very casual, about 4:30 every afternoon for appetizers and conversation. 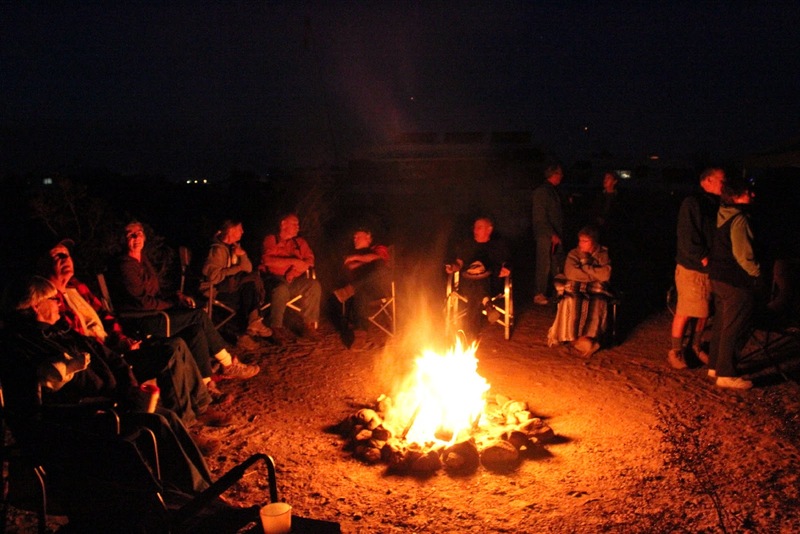 After sunset, Roger lights the campfire and the group moves around the fire. Some of the nights cooled off rapidly once the sun went down. 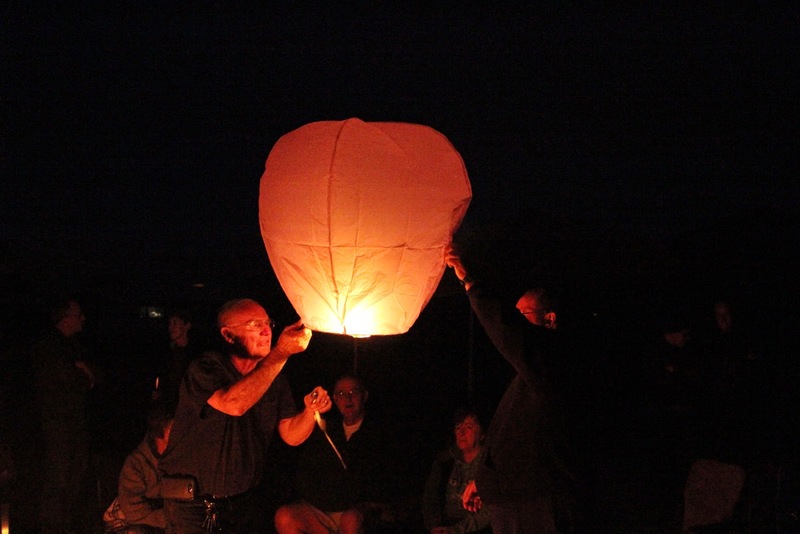 Then Roger has collected some Chinese lanterns which are lighted to provide entertainment. It takes a little while for the flame to create heat that will help the balloon to rise. Roger, on the left, and a helper will hold on until they are sure the balloon will rise and not run into any local rvs. And then, off it goes. Sometimes, they rise slowly, and other times they take off very quickly. Everyone at the fire checks to watch the lanterns rise and disappear in the distance. It's pretty safe in the desert. 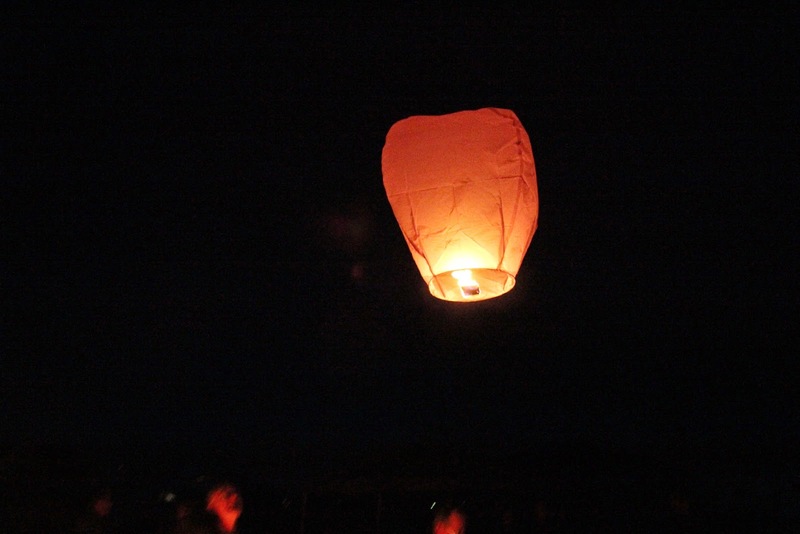 The fire under the lantern goes out long before the lanterns descend back to the desert. 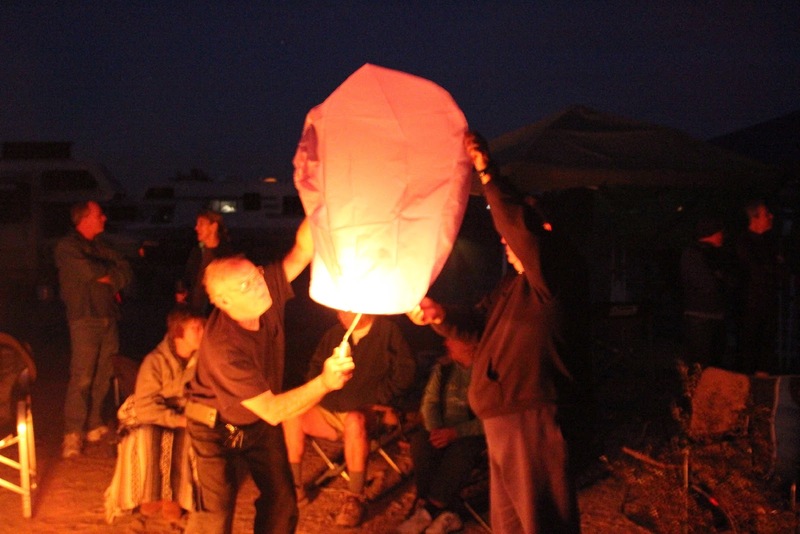 We also are watching other lanterns from campers at La Posa and other campgrounds.